I had this grand plan to sew a season ahead of time and theoretically I do think it's a good idea. In practice though, I'm having a hard time with it because it's just impossible to think about spring clothes when it's 9 degrees with two feet of snow outside. 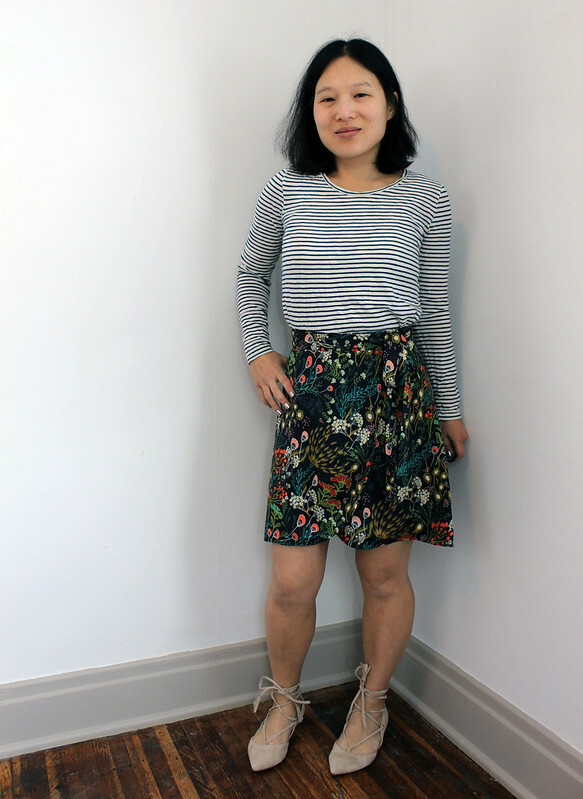 A simple wrap skirt that I should have been able to finish in a weekend took me two weeks instead because I just didn't feel like sewing. I purchased 1.5yds of navy floral Art Gallery rayon from fabric.com. I also purchased 1.5yds of navy bemberg rayon because I worried the Art Gallery was too sheer for a skirt. I'm really glad I did because I think a lining was necessary. I used Simplicity 8606 that I had bought during a $1.99 sale at Joanns. I sewed View C in a size 10 with no fit alterations. I don't like any of the other views but I might sew this version again someday. I used black tricot interfacing in the non-stretch direction for the waistband. To do the lining, I cut the skirt pieces out of bemberg and stitched them together. Then I trimmed 1/8" off the outer hem edge of just the lining and sewed the shell and lining right sides together. I trimmed and notched the curves, understitched the lining, then turned and pressed it so that only the fashion fabric showed on the outside. It was a bit of a pain but actually less annoying I think than trying to do a narrow hem on the outer edge. For the remainder I followed the instructions. The length is just right for me, so be forewarned that for more average-heighted folks View C is very short. I think it would also be difficult to lengthen because of the curved shape of the pieces and there are no lengthen/shorten lines on the pattern. 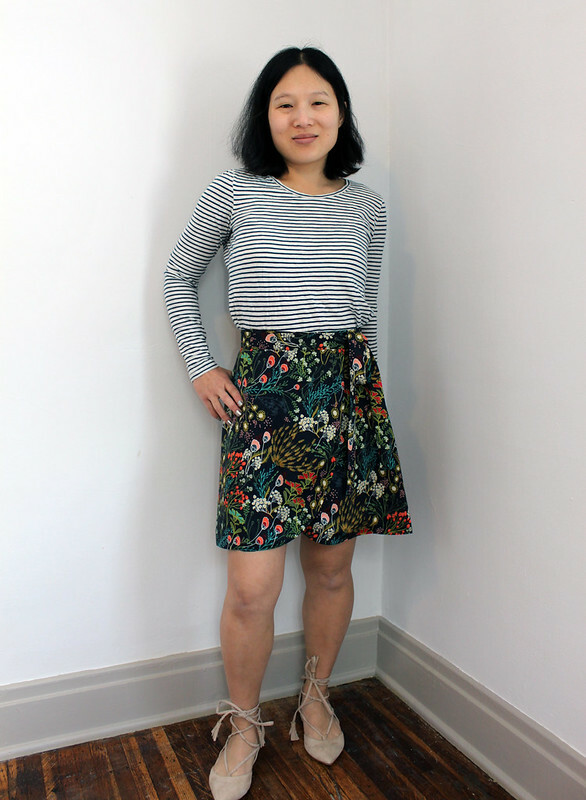 I do really like the skirt and I think it'll be wonderful for spring and summer. Wrap skirts remind me of the 90s. I used to wear a bunch as a teen but the annoying part was that they always wanted to fall open. I haven't worn this one enough to find out if it's comfortable but if I remember I'll report back when I figure it out. I'm not sure what I will sew next. Right now I don't really feel like doing much of anything but I'm sure inspiration will strike eventually. For now I'm not forcing it. I've decided to skip sewmystyle for February because the two patterns on offer are not unique or different enough to justify my buying yet another t-shirt pattern. I'm also not that thrilled with how the challenge is being run so far with very little notice of what the next month's designs will be so I don't know if I'll go back to it or not.